NASA explanatory scientists announced Thursday that the Kepler Space Telescope has found an Earth-like planet in our galaxy. Elisa Quintana, exoplanet research scientist for the SETI Institute at NASA’s Ames Research Center, says the planet is in the “Goldilocks zone,” just the right distance from its star that liquid water could exist on the planet. While the Kepler mission has found 69 exoplanets that orbit in the habitable zone, Kepler-186f is the closest to Earth’s size. The planet’s composition, whether it is a rocky planet like Earth or a gas planet like Neptune, is still unknown. Less than 10 percent larger than Earth, its size and distance from its star make it a milestone on the mission to find potentially habitable planets outside our solar system. The Kepler Space Telescope, launched in March 2009, has been constantly surveying a strip of 150,000 stars in our galaxy, looking for exoplanets — planets outside our solar system. Its primary mission is to find potentially habitable planets. 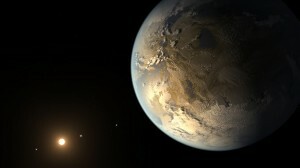 To date, the mission has confirmed the existence of 961 exoplanets, and 3,845 planet candidates awaiting further study. In May 2013, NASA announced that a wheel inside the telescope malfunctioned beyond any possible repair. Even though the telescope has been offline since then, scientists have continued to comb through four years of data. Kepler-186f is in the Cygnus constellation, 500 light years from Earth. Its star is half the mass and size of the Sun. It is the outermost of five planets circling the star Kepler-186. The planet orbits its star once every 130 days, and it receives about a third of the solar radiation that Earth does, putting it on the edge of the habitable zone. That doesn’t mean that the planet can support life, said Sara Seager, professor of planetary science at MIT. According to Seager, it is unlikely that we will find out if its atmosphere could be habitable or not. The planet and its star are so far away and so faint that it’s difficult to observe its atmosphere at the moment. “It’s a celebration of an announcement, kind of like when a baby is born,” she said.